As you throw out yet more soiled hamster bedding, you have a thought: can you train your hamster to use a litter box? After all, it’d be more convenient for them since their waste would be contained in one area. It’d be convenient for you, too, since you’d have less cleanup. I decided to research the topic to bring you the answer. Hamsters can be potty-trained, so to speak, to use a litter box. Since it’s within the natural inclinations of a hamster to make waste in a single area, this training shouldn’t be too difficult. Are you curious how to train your hammy to use a litter box? 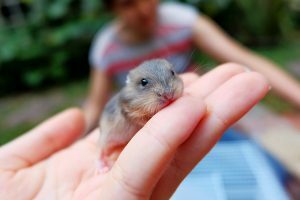 In this article, we’ll go over all the nuances of training so you have a happier hamster and a cleaner cage. What Can You Use as a Litter Box for Your Hamster? Hamsters aren’t picky creatures. They’ll use just about anything as a litter box with some training. No, seriously. Chances are, you have an item lying around your house that can be repurposed as a litter box. Here are some DIY options you might try. A ceramic bowl or dish makes for a nice training zone for your little hammy. If it’s a sheer or white dish, you’ll certainly be able to see if your hamster is making waste and just how much. You will have to add sand to the dish, otherwise it will be hard for your hamster to gain traction. Do you have old Tupperware you’re not using anymore? This is the perfect item to repurpose into a hamster litter box. Using scissors, you can trim the Tupperware or even cut a hole in the middle large enough for hammy to get through. Do be sure there are no sharp plastic edges your hamster can cut themselves on! You should also double-check there’s no old food residue leftover either. Your hammy will try to get a free meal! Speaking of free meals, one of the downsides to plastic litter boxes like Tupperware is that your hamster might begin to gnaw on the thin plastic. If they do, you’ll have to throw out your makeshift litter box. If you don’t have any ceramic dishes you can part with, you may have some glass ones. Bowls are just as suitable. That said, many hamster owners recommend this option for smaller species, so Syrians would be excluded. That’s simply because most glass bowls and dishes aren’t that big. If you have a larger one, then you can use it for any hamster species you want. Like a ceramic dish, you’ll need sand so hammy doesn’t slip and slide whenever they try to do their business. The cheapest option by far is a cardboard box. You can take any cardboard you have and cut it down to size for your hamster. Like the Tupperware, make sure there are no sharp edges or points your hammy can get hurt on. While cardboard is cheap, it’s a lot less durable than the other litter boxes we’ve discussed. Urine will stink quickly and feces will pile up. You can’t really clean cardboard the way you can ceramic, plastic, or glass. That means you’ll have to throw the cardboard away at least weekly and sometimes even more often than that. Do keep in mind that if you use these common household items as litter boxes, you shouldn’t ever use them for their intended purposes again. That would just be unsanitary. Make sure you’re willing to give up the said item for hammy then. Otherwise, you can buy an actual hamster litter box. Here are a few store-bought varieties you might be interested in. The Lock-N-Litter Pan from Ware Manufacturing accommodates for the fact that sometimes hamsters like to pee up the wall. With its tall plastic walls, you never have to worry about urine or feces messes traveling farther than they should. The wire floor prevents hammy from stepping into their waste after they make it. You can place this litter box in the enclosure or install it to the cage wall. The plastic is supposed to be odor-resistant, but you should still dump this box daily. The inexpensive Alfie Small Animal Bathroom House is enclosed for hammy’s privacy. Another plastic option that should cut down on odors, the litter box has an opening for both dumping litter and scooping up messes. To make that unenviable task easier, you even get an included colorful plastic pooper scooper. How handy! Simple but effective, the Potty Trainer Corner from WYOK is a plastic contraption that can fit in even smaller cages. Available in several colors, this all-plastic litter box has holes in the floor to prevent dirty hamster feet. You simply remove the floor panel to drain the waste. You can then wash the Potty Trainer Corner out and use it again and again. A favorite among Amazon users, you might also get your hamster hooked on the Nydotd Triangle Pet Potty Toilet Trainer. The holes and cage hooks are meant to stay put so your hammy never has to stress about slipping when trying to do their business. This litter box is a little bigger than some of the others. It has a height of four inches, a width of seven inches, and a length of almost 10 inches. It too is plastic and non-stick for fast and simple cleanup. Which Type of Litter Is Best? Now that you have your box, you need some litter to fill it with. Here are some options you might select. Paper pellet litter is cheap but effective. What’s even cheaper is making your own. Using soft paper like newspaper, cut it or rip it until it’s pellet-sized. Slim strips are also okay, but don’t make them too big. Since paper litter is so inexpensive, it’s not a big deal if you have to dump it all out when you clean hammy’s cage. For the most part, you should notice less urine smell compared to some other litter types. That’s because urine is absorbed into the paper quickly. Critter Litter is a favorite for a reason. You won’t pay much for several pounds of the stuff. A little goes a long way, too. Like paper, urine absorption is one of the best qualities of Critter Litter. Unlike newspaper-based litter, if your hammy urinates on Critter Litter, you can remove only the urine-soaked litter and leave the rest. It’s worth mentioning that some hamsters have tried to eat Critter Litter, so keep an eye on your hammy to see if they do the same. Finally, there’s sand. Not all sands are created equal, and thus, you should try to get chinchilla sand. 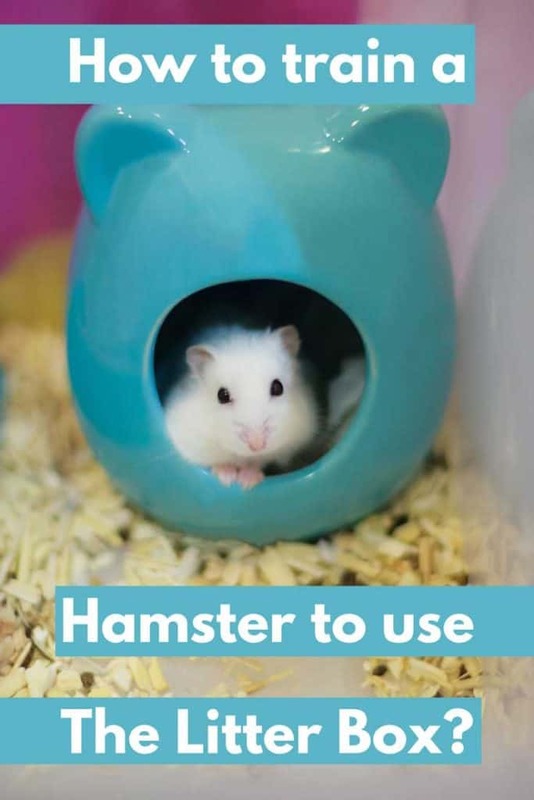 While it’s a little pricey, it’s safe for your hamster to use. They can burrow underneath it, make themselves a comfortable space, clean themselves in it, and yes, make waste in it, too. Other sands might need to be sterilized, so always shop carefully. Hamsters are a lot less inclined to eat sand. However, it’s not nearly as good for urine absorption as paper or Critter Litter is. That means almost daily cleanups must become part of your routine. 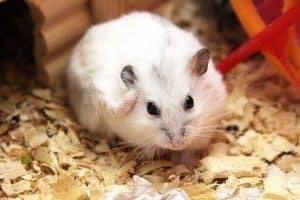 In some instances, if you have a male dwarf hamster, their scent glands may get backed up if they roll around in the sand too much. This seems to only occur in male dwarves. If that’s your hamster species, you might reconsider sand or monitor hammy’s usage if you have it. How Do You Train Your Hamster to Use a Litter Box? With all your supplies in tow, you can start training your hamster to use a litter box. Here are the steps to follow. Step #1: Your hamster will have a particular corner of their cage they like to make waste. Track which corner this is. The corner will become the home to their litter box. Step #2: Make sure the box is full of litter, be that paper or sand. Besides that—and this is going to sound weird—you also want some feces and/or urine-soaked litter in the box. Why? It shows hammy that the box is a safe place to do their business. Step #3: If your hamster hasn’t gravitated to the box on their own, you can always move them towards it. Only do this if your hamster is already awake. Step #4: Step back and let hammy do his or her thing for a moment. They’ll likely check the box out, walking around it, smelling it, and maybe even exploring or using it. Step #5: Keep this up. The more acclimated your hamster gets to their litter box, the more inclined they become to use it. Step #6: Don’t expect both defecation and urination to occur in the box. It depends on the hamster for sure, but it’s more common for a hamster to urinate in their litter box than defecate in there. They may do that outside of the box. This is normal. Step #7: The best way to ensure your hamster will keep using the litter box is to keep it clean. Empty soiled litter daily and add fresh litter. Clean the box at least weekly, but never when your hamster is using it. Training your hamster to use a litter box means they make fewer messes in their enclosure. They stay cleaner longer, as does their cage. You now spend less time cleaning up their messes. That makes you both happy. With so many litter box options available, there’s no reason not to start potty-training your hammy today!